Florian advances with the win to 10-3; Thomas declines to 23-8. Kenny Florian winner by submission at 4:31 in the 1st round by rear naked choke. Cole Miller winner by unanimous decision at 5:00 in the 3rd round. Dustin Hazelett winner by submission at 1:14 in the 1st round by arm bar. Gray Maynard winner by knock out at 0:09 in the 1st round. Chris Leben winner by knock out at 3:56 in the 3rd round. Thiago Alves winner by TKO at 4:04 in the 2nd round. Nate Quarry winner by knock out at 0:44 in the 3rd round. Nate Diaz winner by submission at 4:10 in the 1st round by guillotine choke. Call 702-505-6988 for VIP Las Vegas MLS search by a Las Vegas real estate agent. 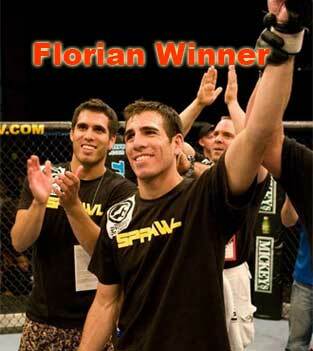 UFC Fight Night Ken Florian vs Din Thomas has Florian winner by submission.